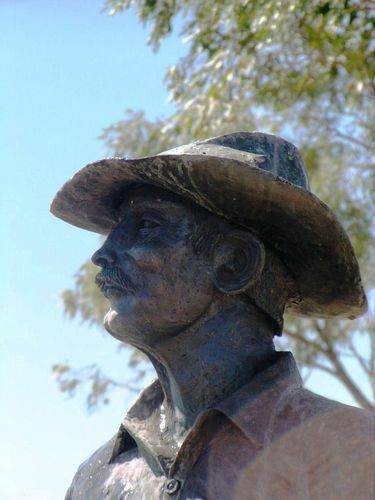 Statue commemorates the early pioneers of the Northern Territory Cattle Industry. Nat Buchanan was the first to overland cattle across the Barkly Tablelands and later the Murranji Track, the "ghost road of the drovers" (when he established Wave Hill Station). These two tracks were vital for the industry and both cattle and human lives were lost, as there was minimal or no water on these major stock routes. Many places on The Track were vital to the adventures of Buchanan and others. A typical example was the original Newcastle Waters and then Newcastle Waters the settlement. In 1911 the Commonwealth Government took over the NT and in 1917 established a depot at Newcastle Waters for the construction of 13 bores across this waterless land (which took seven years to build).